I recently had company over and they brought over these delicious small bites for us to nosh on while dinner was being prepared. The mildly sweet Medjool dates paired so well with the savory bacon, while the goat cheese offered a wonderful kick of flavor at the end that brought it all together. Of course I had to ask for the recipe so I could make them again to share with you! Enjoy! 1. Preheat oven to 375F. Stuff the Medjool dates with the goat cheese. 2. You will need one strip of bacon for every two dates. 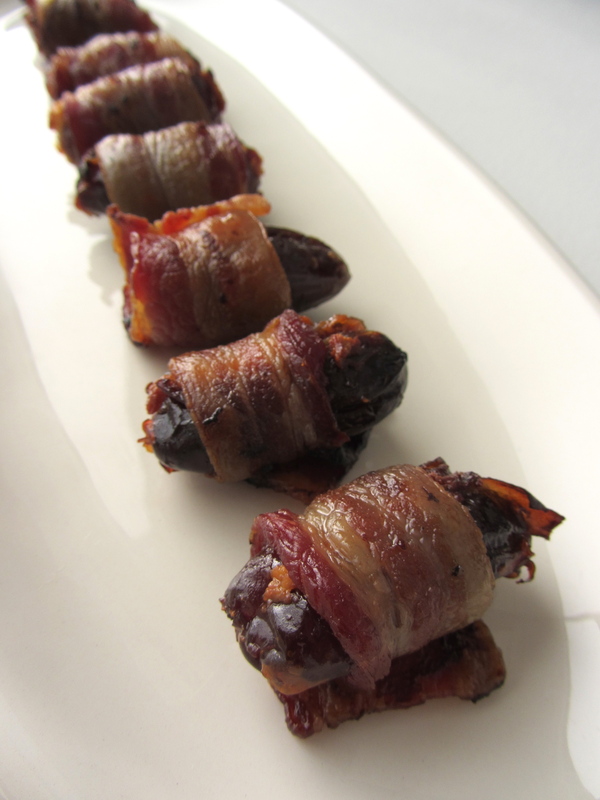 Cut the bacon strips in half, then wrap each date by rolling the bacon around it. 3. Place the wrapped dates seam-side down on a baking sheet. Bake at 375F until the bacon has stopped bubbling and is cooked through, about 15 minutes. * If you like them crispy, bake 3-5 minutes longer, but don’t overcook them. Remember, bacon will crisp up as it cools. If left in the over too long, it can go from perfectly crisp to terribly burnt very quickly. * Use thin-cut bacon; the thicker cut takes longer to cook, in which time the dates would burn.